When it comes to pasta, I’m a traditionalist. I don’t approve of restaurant chefs who need to vaunt their “creativity” with dishes whose ingredients have never before encountered each other on a plate. There’s a reason some pasta combinations are classics: they work! But even a cranky person like me can occasionally appreciate something new. 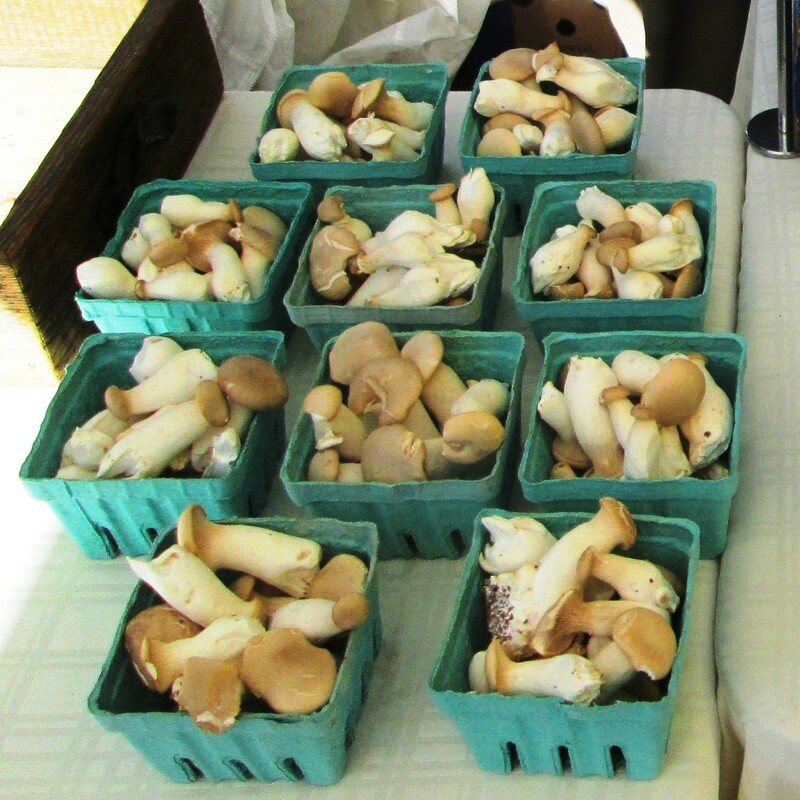 This time it came about because Tom noticed that a farm stand at our Greenmarket was featuring boxes of very fresh, small king oyster mushrooms. He couldn’t resist them. We’d had ordinary oyster mushrooms before, but not this different variety, which have been available locally only in much larger, stemmier sizes. 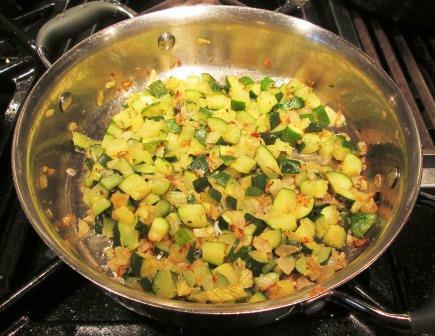 I looked them up in Elizabeth Schneider’s magisterial Vegetables from Amaranth to Zucchini to see if they needed any special handling. 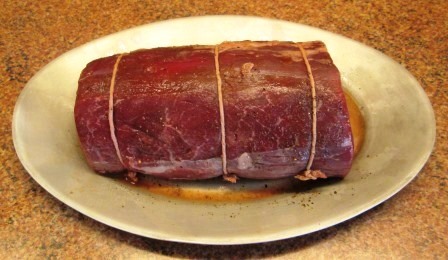 The answer was yes: moist cooking to tenderize the very dense flesh. 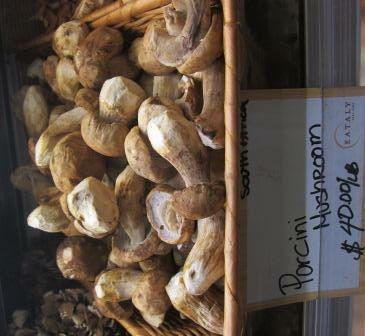 Then I needed a recipe to make them with, so I did an Internet search for recipes using oyster mushrooms. 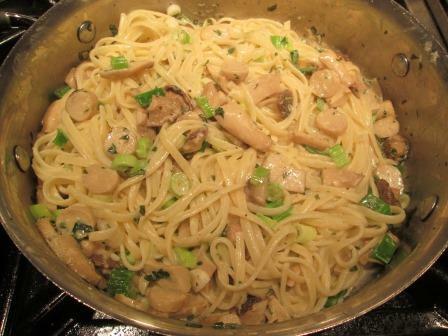 The description of this one attracted me: “Oyster mushrooms are poached in butter and cream and tossed with pasta, Parmesan cheese and green onions.” Obviously, that’s not a classic Italian pasta preparation, but there was a reason I decided to try it: I happened to have a lot of scallions in the refrigerator. 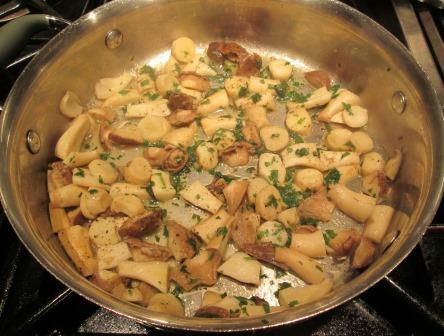 My faithful knife man cut the mushrooms into small pieces, which I was to sauté for six minutes in butter, adding parsley, salt, and pepper for the last minute. Apparently if they had been the common oyster mushroom, as in the recipe, they’d have been tender by that point, but these sturdier ones weren’t yet. When I poured on the recipe’s amount of heavy cream, I could see that it wasn’t going to be enough liquid for poaching, so I took it on myself to add a little broth. 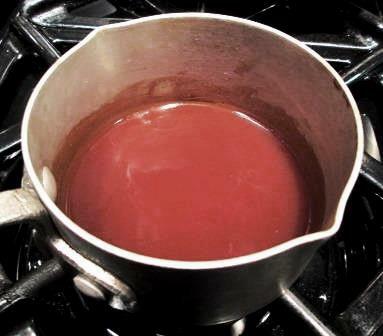 Next I was to cook the mixture “at a gentle boil” for about five minutes, until the sauce thickened slightly. 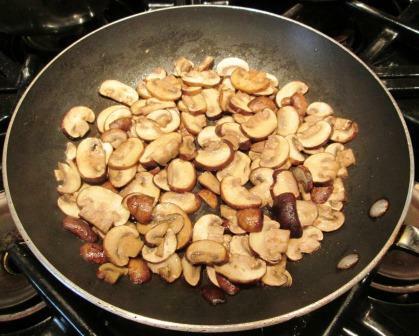 I was concerned that doing so might dry up the sauce and toughen the mushrooms, so instead I covered the pan and simmered it until the mushrooms were tender. The sauce didn’t thicken much, but I didn’t consider that a problem. 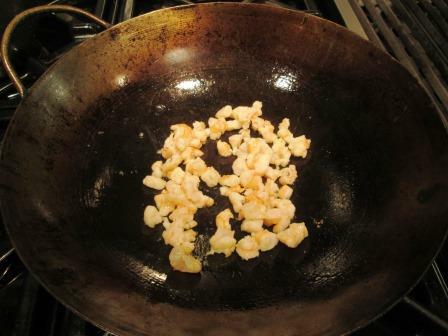 I set the mushroom pan aside while I cooked the pasta – linguine, as recommended – and chopped up two of my many scallions. I finished the dish right in the pan of sauce, tossing in the drained pasta, the scallions, and a few tablespoons of grated parmigiano. I really hadn’t been expecting much, especially with the scallions going in raw at the end like that, but to our great pleasure everything came together extremely well. The linguine absorbed a good amount of the sauce, leaving the dish just moist enough. 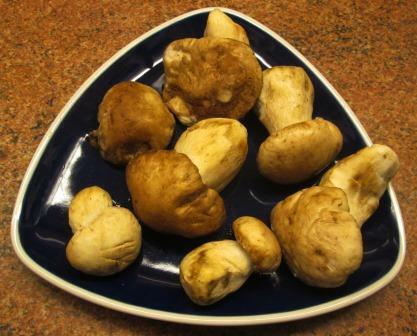 The mushrooms were delicious – the caps tasting noticeably different from and even better than the stems. 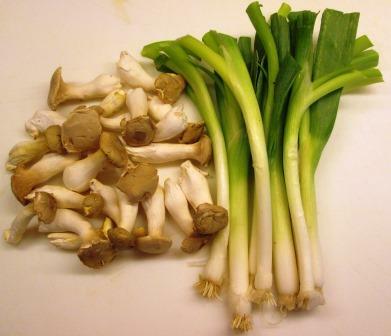 The scallions also made a real contribution to the harmony of flavors, aromas, and textures. I still wouldn’t call this an Italian dish, but it certainly was a good one. Guess I have to admit that the “classics” don’t have an exclusive lock on excellent pasta combinations. In every book of Martin Walker’s “Mystery of the French Countryside” series, police chief Bruno Courrèges finds time between pursuing criminals and preserving the peace in his Périgord village to make fabulous meals for his friends. When Bruno cooks, readers are right there in the kitchen with him, and for enthusiastic home cooks, the urge to step in and help out is almost irresistible. Of course we couldn’t reproduce that meal exactly: Much of what Bruno eats he grows or gathers for himself, or else buys from artisans at his village’s outdoor market. But we came as close as we could. Bruno wasn’t originally planning to have this course, but one of his guests, a young Haitian woman from the Ministry of Justice, brings him a jar of épice, her mother’s version of Haiti’s all-purpose spicy green sauce. 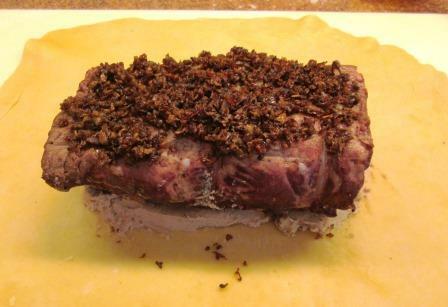 Bruno opens a can of his homemade venison pâté so everyone can taste Amélie’s gift with it. 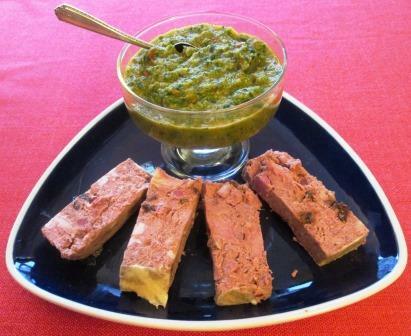 We couldn’t find a venison pâté, so we substituted a rabbit terrine and created our own épice with guidance from recipes on the Web. It was very easy to make. We simply pureed small amounts of green and red Bell peppers, two hot Serrano peppers, a tiny red onion, scallions, garlic cloves, lots of parsley, and a little basil in the food processor. It was a lively sauce, tasting bright and intensely vegetal at first, with a sneaky zing of heat just as you were swallowing. 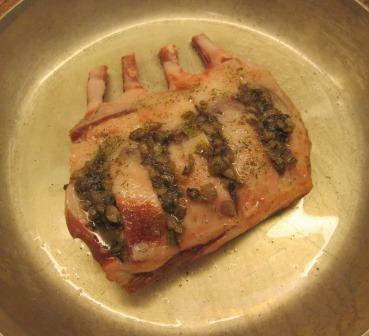 It gave a nice lift to the lushness of the terrine. 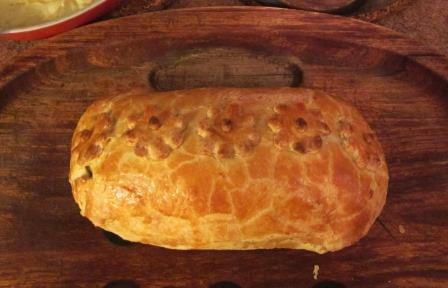 We could even have taken it a bit hotter – maybe try a Scotch bonnet pepper next time. 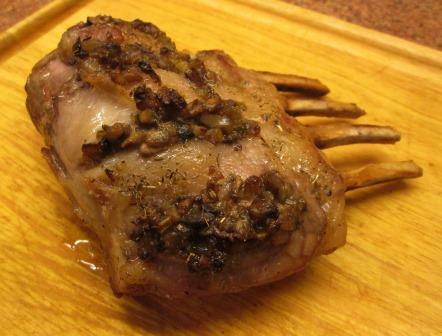 With this appetizer Bruno served a sparkling Bergerac rosé wine. We drank an Alsace crémant, a regional transgression that nevertheless worked quite nicely. 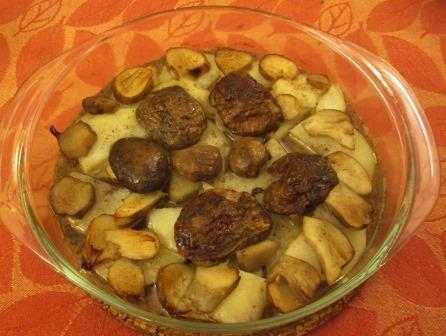 One way to tell this must be a Périgord recipe is that it starts by cooking diced potatoes and crushed garlic in a casserole with duck fat. Fish soup made with duck fat! – totally new to us. 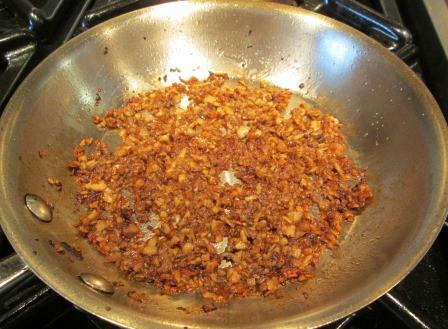 Fortunately, I had duck fat in the refrigerator, so we were off to an authentic start. Continuing to do as Bruno did but guessing on quantities, most of which aren’t given in the story, we then added cubes of fresh cod, chopped canned tomatoes, stock that we’d made from shrimp shells, and a glass of white Bergerac. All that simmered along until the fish was done, when we adjusted the salt, poured in another glass of the wine, stirred in chopped parsley, and served. 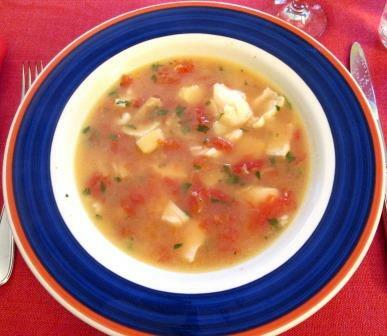 It was unexpectedly rich and hearty for a thin-bodied soup made so simply from cod. 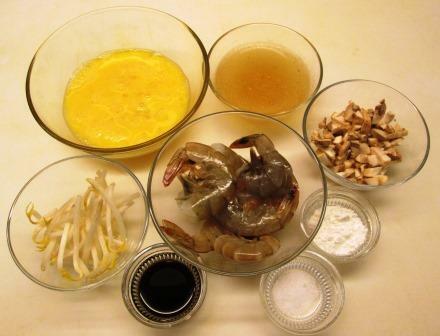 We could just detect an undertone of the shrimp-shell stock’s flavor. 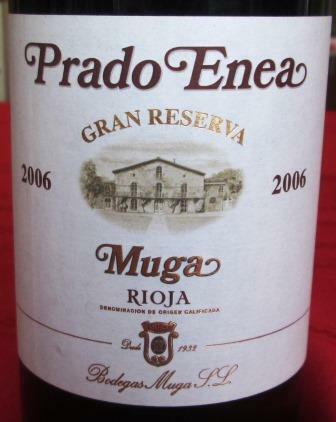 The wine also made a definite contribution. We were lucky to have found that bottle of Bergerac. It’s uncommon here and was very distinctive: slightly herbal-spicy and only barely not sweet. 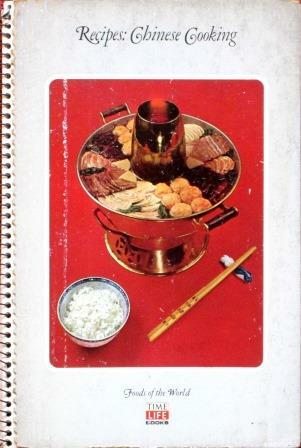 But there was something more unusual in the soup’s flavor that we struggled to identify. Finally we remembered: the duck fat! It gave the soup an almost meaty essence. We three liked it as much as Bruno’s guests did. And we, like them, happily drank white Bergerac with it. Even at first reading, we were each struck by the oddity of serving a soup and a stew at the same meal. We were still dubious about it after deciding to make the full menu, but we put our trust in Bruno and went ahead. 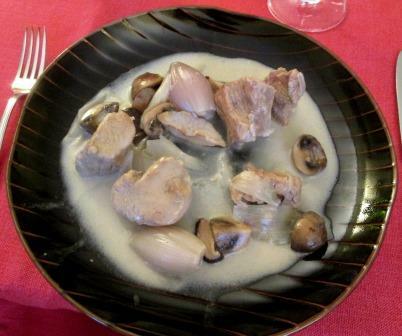 To save some work on the cooking afternoon – and since stews are always better the second day – Hope undertook to prepare the blanquette herself on the preceding day and bring the finished dish to us. 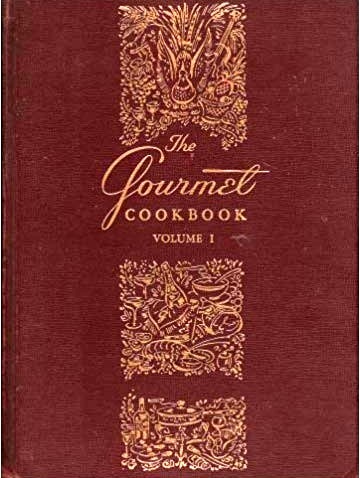 This entailed simmering two pounds of cut-up veal with aromatic vegetables, separately sauteeing a pound each of shallots and mushrooms in butter, thickening the veal cooking liquid, and stirring in the veal, shallots, mushrooms, and much heavy cream. 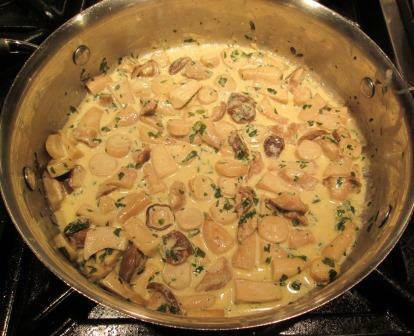 The blanquette was luscious, especially since Hope had used shiitake for half the mushrooms, instead of all small whites. 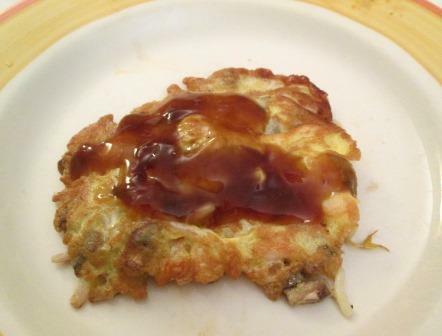 The sauce had perversely not thickened quite as much as it should have, but it made a delicious dipping medium for crusty bread, as well as a sauce for the rice. 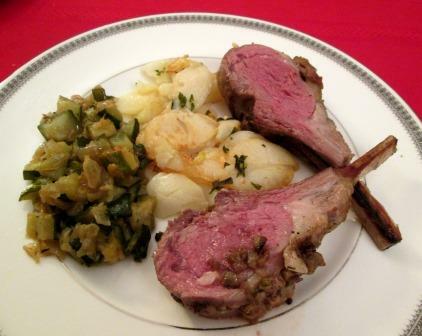 With this course, Bruno served Pécharmant, a light red Bergerac wine made in Bordeaux-blend style. 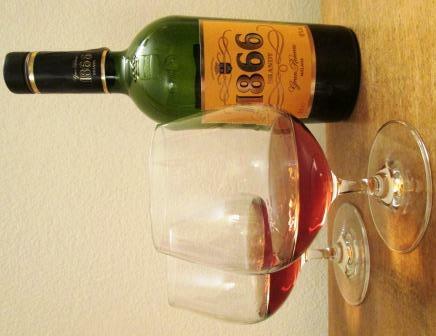 We had a modest Bordeaux wine of the same grape blend. We know Bruno intended to have salad and cheese at this meal. Before the guests arrive, he picks and washes salad greens from his garden and takes cheese out of his refrigerator. But that’s the last they’re heard of. As the dinner progresses, Bruno offers second helpings of the blanquette, and in the next paragraph he brings in the dessert. Well, even Homer nods. We had our salad and cheese, but to honor Bruno’s omission, I didn’t take a photo of them. 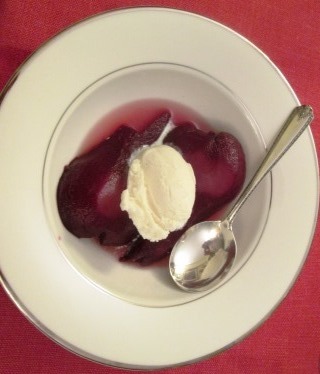 Bruno poaches his pears in red wine to cover, with cinnamon, cloves, nutmeg, and half a glass of his own vin de noix. We did the same except for the walnut liqueur, which is unattainable here. 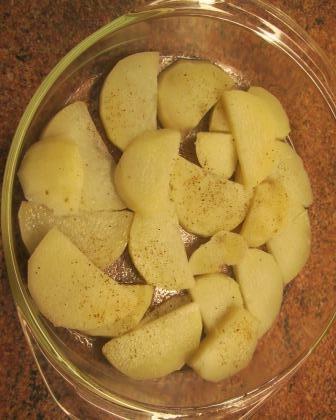 Also, Bruno seems to have left his pears whole, but we halved and cored ours first, because they’re so much easier to both cook (less wine, less time) and eat (no maneuvering around the cores) that way. We did, however, follow his manner of serving them, with a splash of sparkling wine and a scoop of excellent vanilla ice cream in each bowl. To make up for the absence of vin de noix, we awarded ourselves glasses of Bruno’s favorite dessert wine, Monbazillac. 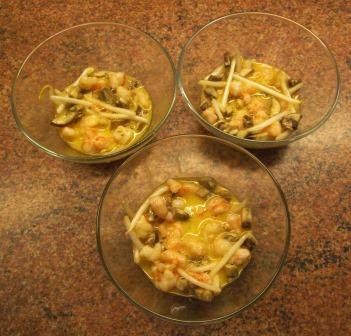 We three thoroughly enjoyed each part of this meal, as well as the making of it. 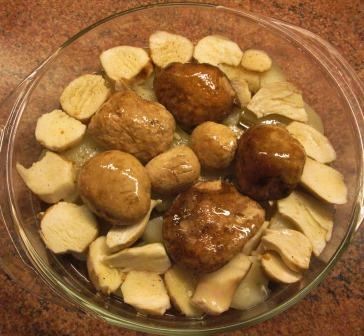 But, for all our admiration of Bruno and his creator, we can’t commend the dinner as a whole. For us, the sequence of soup and stew didn’t work. 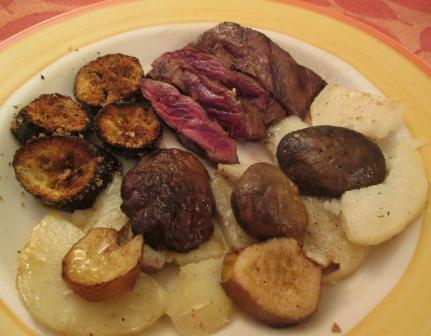 The two dishes were too similar in color, texture, and general character for the palatal contrasts that are part of the pleasure of a truly great meal. 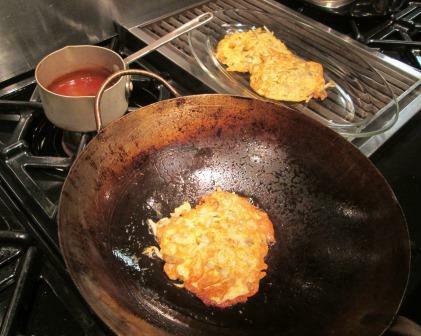 Just too much of the same thing – especially with the richness of the duck fat, cream, and butter. We’d had greater success with the harmony of a previous Bruno feast we’d tried. 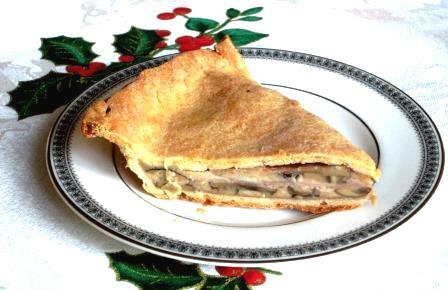 For the first course of Christmas dinner last week, I turned to a recipe of my own from The Seasons of the Italian Kitchen: a savory pie of ham and mushrooms in a béchamel sauce enriched with parmigiano cheese. 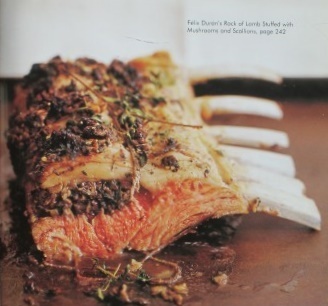 It has several advantages in the context of a festive menu for guests: It needs no unusual ingredients, it’s easy to make, and it can be prepared several hours in advance – no last-minute attention required. 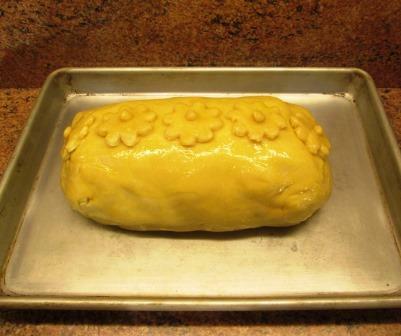 In English, “torte” properly means a cake, but in Italian this dish is called a torta. It’s a sort of gentrified pizza rustica, a sleeker modern version of that hearty peasant pie filled with assorted cheeses and cured meats. In any language, it’s very good. 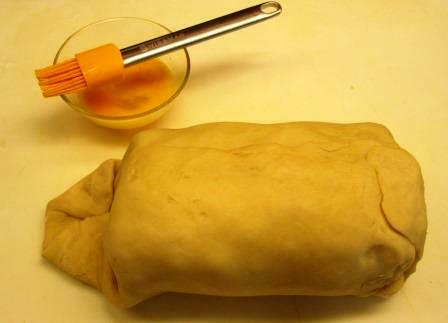 The pastry – an all-butter short crust enriched with an egg yolk – can be made up a day or so ahead and refrigerated until needed. 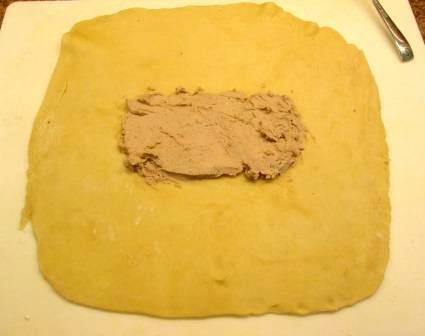 (Or use any good basic pastry recipe.) For the rest, here are the ingredients as I assembled them on Christmas morning. 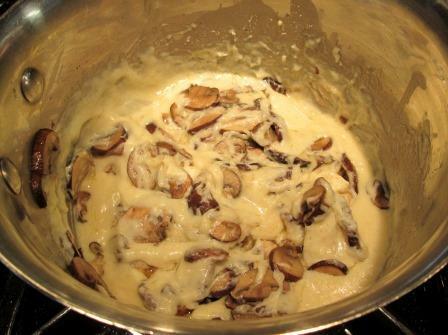 Beloved Spouse had obligingly sliced the half pound of cremini mushrooms for me (plain white ones instead are good too), and I sauteed them in butter for about five minutes. Then I made the béchamel sauce, using a cup of milk, a tablespoon of flour, and two tablespoons of butter. 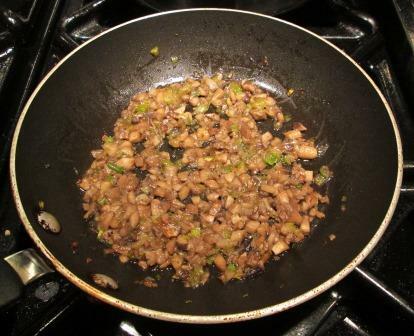 When it was done I grated in some nutmeg, stirred in 3½ ounces of freshly grated parmigiano, and folded in the mushrooms. 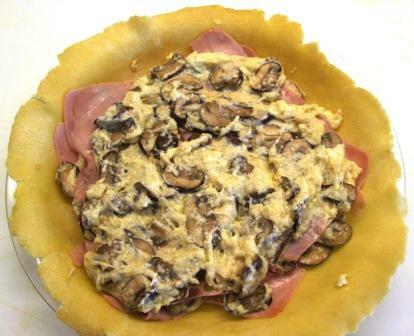 I rolled out half the pastry, fitted it into a 9½-inch pie dish, and filled it with alternating layers of the thinly sliced boiled ham and the mushroom mixture. With the addition of a top crust, the torte baked for about an hour at 350° and sat peaceably on a sideboard all afternoon, to be reheated briefly in the oven at dinner time. 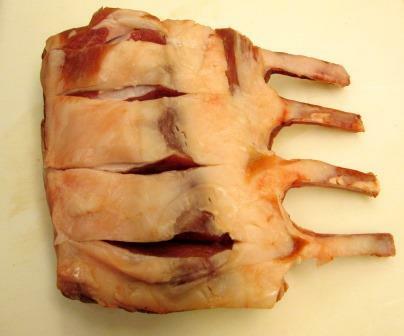 It’s always quite plain looking, but the taste makes diners forgive the appearance. 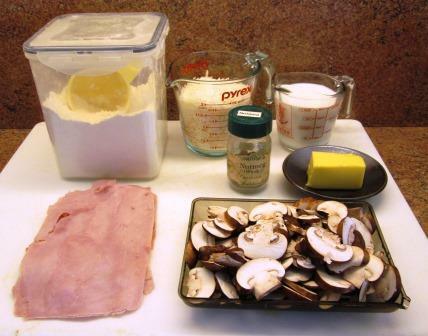 The ever-popular combination of ham and cheese, the latter infusing the béchamel, which in turn blends in the mild woodsy flavor of the mushrooms, all make the torte more complex and interesting than the simplicity of the ingredients suggests. 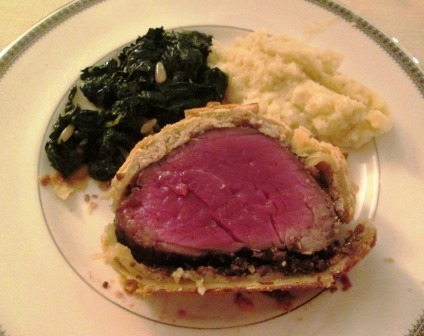 It’s an example of the kitchen alchemy that makes a whole greater than the sum of its parts. For eight years now I’ve been doing a post on this blog every week. I’m going to loosen the intervals a bit this year – especially for the rest of this month, when I’ll be concentrating on very plain cooking so I can shed a few extra pounds from the holiday overindulgences. I’ll be back online when I again start exploring recipes that will be interesting for me to write about and, I hope, for you to read about. Meanwhile, best wishes for 2018.